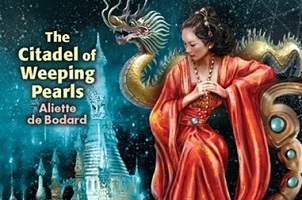 If this sounds complex that that's because it is - The Citadel of Weeping Pearls has a much more complex structure than the previous Novella, is told through no fewer than 4 individual viewpoints, and follows much more intricate and tangled story threads. The overlap with the previous book is minimal, there is only one character which appears in both, and even this is more of a cameo than a narrative necessity. The other, maybe even bigger difference though is the compactness, or maybe rather closed-off-ness of the story. Where On a Red Station had clearly defined story arc between Linh arriving and leaving again there is no such simple bracket in The Citadel. Instead it feels much more like an intermediate episode in a larger story, a decision point where the tracks are chosen for the future direction of events - I guess the structure really is much closer to the 'Slice of Life' approach frequently used in Manga and Anime, for example. This lack of story arc and closedness has led to criticism of the story, accusing it of being not a 'proper' story (er, why? ), of being too much talking and not enough action (no, it's no action story. no, I don't think that's an issue), and of not being able to identify with and root for the protagonists, as their motivations and background is not logical and relatable. In regards to that last point it's worth pointing out that, not only does the story greatly play on the family values and focus inherent in all of Aliette's Xuya stories set in the Dai Viet universe, but it also focuses on the Imperial Court, with characters tied into the political network and traditions set over millennia as much as into their own family and social networks, and the tensions and conflicts of interest which can and do result from that. Or from being severed from one or the other of those. If this makes it hard to relate to the characters then that might indeed be inherent in this (for most of us) alien setting, and all the traditions and associated cultural inertia it contains. It also means that the logic of how people define their loyalties, how they react, and the logic of those decisions in their ancient, and ancestor-controlled culture do not always match the logic of how you or I would react and decide. What stood out for me in this story was the personal impact of decisions in the past - made for all the right reasons at the time, and utterly undesirable now. And especially the impact of decisions and behaviour by mothers - this is very much a mother/daughter story: of the Empress and her banned Princess, of her sister the Princess and the Shipmind she gave birth to, and of the Engineer and the mother who abandoned her. The story contains a magical box in the shape of a time machine, pieced together in a backwater by a scholar who left the court to look after her ill father, and an Engineer whose mother left with the Citadel. And whilst the take on the time travel paradox which is used is rather neat (and not one I can remember coming across before) it still felt rather McGuiver, and a bit (together with the teleportation, mental martial arts abilities etc) of a departure from the usually quite classic, technical Space Opera which normally dominates Aliette's future Xuya stories. Now, let me not come across as overly negative - this is a great story, told in a, for a piece of that length, rather complex structure, and in sparse and tense language which I much enjoyed. It is markedly different from the earlier Novella, but not in a bad way - greatly recommended, and should it show up on the Hugo shortlist (it's nominated, and by the time you read this the shortlists will have been announced – ah, to know the future!) then I can certainly recommend that you read it and vote for it! Thanks to the author for the review copy!